a region of space at each point of which a given physical or mathematical quantity has some definite value; for example, a gravitational field, magnetic field, or electric field; and, in meteorology, a pressure field, temperature field, etc; if the quantity specified at each point is a vector quantity, the field is said to be a vector field. a process by which currents or winds push around thin ice so they slide over each other. rounded, well-bonded snow that is older than one year; firn has a density greater than 550 kilograms per cubic-meter (35 pounds per cubic-foot); called névé during the first year. the minimum elevation of firn lying on a glacier surface; each year's firn line marks a glacier's annual equilibrium line; also called firn line. the minimum elevation of firn lying on a glacier surface; each year's firn line marks a glacier's annual equilibrium line; also called firn limit. 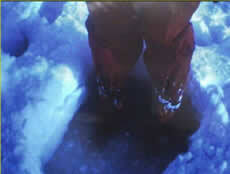 the height of meltwater within saturated firn that is trapped over ice in a glacier. a thin sheet of ice formed on the glacier surface by rapid refreezing of solar-heated snow or firn, usually at high elevations during spring. 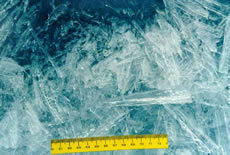 floating ice of no more than one year's growth developing from young ice; thickness from 0.3 to 2 meters (1 to 6.6 feet); characteristically level where undisturbed by pressure, but where ridges occur, they are rough and sharply angular. glacial troughs that fill with sea water. a navigable passage between pack ice and fast ice. separate patch of floating ice or flat sheet of unbroken pack ice, greater than 20 meters (22 yards) across. 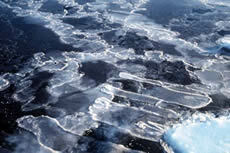 ice that is pushed into the underlying ocean water by the weight of thick snow cover on its surface; the salty ocean water floods the snow cover and creates a salty, slushy layer; flooded sea ice is more common in the antarctic because of more snowfall and thinner sea ice than in the arctic. a small percolation channel that is a beginning path for surface meltwater through snow or firn. 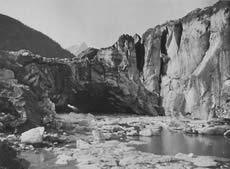 an iceberg that is grooved into a curtain-like pattern; thought to be carved by small meltwater streams. a warm wind blowing down an incline; a kind of katabatic wind. a hydrometeor consisting of a visible aggregate of minute water droplets (or ice crystals), suspended in the atmosphere near the earth's surface; according to international definition, fog reduces visibility below one kilometer, fog differs from cloud only in that the base of fog is at the earth's surface while clouds are above the surface; when composed of ice crystals, it is termed ice fog. layering in glacier ice that has distinctive crystal sizes and/or bubbles; foliation is usually caused by stress and deformation that a glacier experiences as it flows over complex terrain, but can also originate as a sedimentary feature. alternate bands of light and dark on a glacier; usually found below steep narrow icefalls and thought to be the result of different flow and ablation rates between summer and winter. shallow, parallel grooves on the face of a large melting ice crystal. a distinct soil micromorphology, resulting from the effects of freezing and thawing processes, in which soil particles form discrete units that are densely packed. a distinct soil micromorphology, resulting from the effects of freezing and thawing processes, in which soil particles form discrete units that are coalescing. a sea channel connecting the Arctic Ocean and the Nordic Seas, running between Greenland and Spitsbergen. Fram Strait is the passageway where most drifting sea ice exits the Arctic. small needle-like ice crystals, typically 3 to 4 millimeters in diameter, suspended in water, that represent the first stages of sea ice growth; they merge under calm conditions to form thin sheets of ice on the surface, frazil crystals consist of nearly pure fresh water. fine spicules or plates of ice in suspension in water. free water is that portion of the pore water that is free to move between interconnected pores under the influence of gravity. freezing of a material followed by thawing. the changing of phase from water to ice in soil or rock. a measure of how cold it has been and how long it has been cold; the cumulative fdd is usually calculated as a sum of average daily degrees below freezing for a specified time period (10 days, month, season, etc.). drizzle, the drops of which freeze on impact with the ground or with objects on the earth's surface or with aircraft in flight. the advancing boundary between frozen (or partially frozen) ground and unfrozen ground. the cumulative number of degree-days below 0 degrees Celsius for a given time period. (1) the temperature at which a pure liquid solidifies under atmospheric pressure (2) the temperature at which a ground material starts to freeze. the positive pressure developed at ice-water interfaces in soil as it freezes.